A'ja Wilson accomplished a lot in only one year, taking home Rookie of the Year, making the All-Star Game and earning a gold medal. But if you ask the young star about her trajectory, she'll tell you she's just getting started. It’s been a hell of a year for A’ja Wilson. The South Carolina standout was selected No. 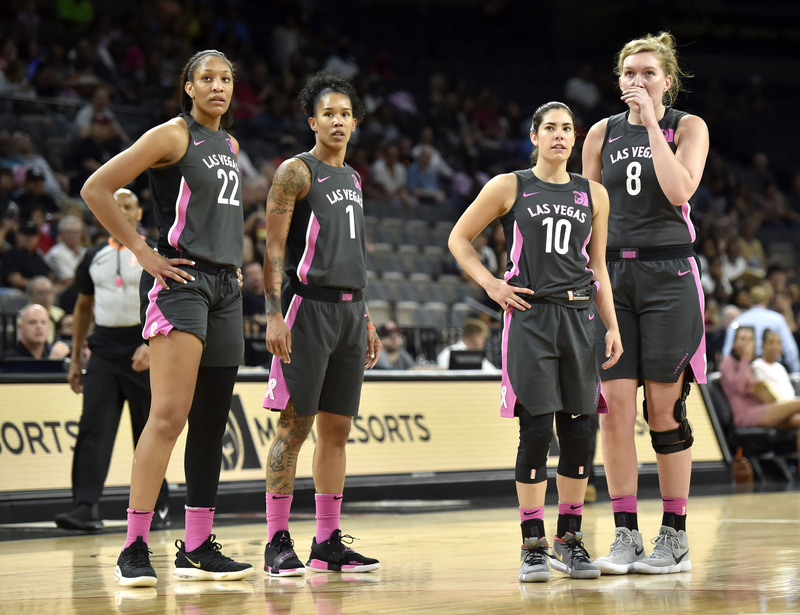 1 by the Las Vegas Aces—who had recently relocated from San Antonio—and expected to breathe life into a franchise that had scraped along the bottom of the league since Becky Hammon's retirement. But those losses provided high draft picks, and the Aces certainly appear to have hit on Wilson and 2017 No. 1 pick Kelsey Plum. Plum had a bit of a disappointing rookie season while trying to acclimate to team structure and the rigors of the professional basketball. A couple games into the season, it looked like Wilson might suffer the same fate. Her debut, in which she scored 16 points on 3–13 shooting against the Connecticut Sun, suggested some early jitters. Then she dropped 27 points against the eventual champion Seattle Storm in her third game of the year and never looked back. While the results would not come immediately, the whole team began to click, with Plum finding her role in new coach Bill Laimbeer’s system, Kayla McBride getting buckets with ease and the Aces’ role players providing a solid base for the team to build on. The Aces started off the season losing seven of its first games, but something was bubbling in Las Vegas. Indeed, Wilson, who recently became the first professional women’s basketball player to join Mountain Dew’s roster of athletes, helped lead the Aces past where many had them pegged ahead of the season. A team that could regularly be depended on to compile about seven to nine wins a season was suddenly in a hot playoff race, and the city of Las Vegas rose up to greet its newest sports team with plenty of love. “They treated us like royalty, like it was crazy,” Wilson said. “No matter what the score was, no matter who we were playing, they always showed out and made a lot of noise. Wilson, whose favorite activity outside of basketball is going to the movies, could be forgiven for thinking Las Vegas’s season would have a cinematic ending. With a playoff spot on the line, the Aces were set to play the Dallas Wings, which was in possession of the last postseason spot, in the penultimate game of the season. A win would all but eliminate the Wings and propel the Aces to the playoffs for the first time since 2014. Alas, Dallas went on to eke out a five-point win against Las Vegas, and an Aces loss to the Atlanta Dream in the final game of the season saw their postseason drought extend another season. A silver lining? Despite finishing just outside the playoffs, the Aces picked up the No. 1 draft pick for the third year in a row, allowing a young, exciting team the chance to add even more talent by the time next season rolls around. You can almost see Laimbeer smirking and rubbing his hands together at the thought. Whether it be Sabrina Ionescu—whose penchant for racking up triple doubles has her atop many mock drafts—or a dynamic guard like Asia Durr, it looks like the Aces are just getting started. Whomever the Aces choose, Wilson will play a large role in their plans going forward. She piled up awards and accolades like they were uncontested layups last season, earning an All-Star appearance, the Rookie of the Year award and finishing the summer with a gold medal from the FIBA Women’s Basketball World Cup. So what’s next for Wilson? She’ll take her trade to China—A’ja in Asia would make a fantastic vlog title—playing for the Shanxi Flame during the WNBA offseason. And when she gets back stateside, expect Wilson to crack a wide, braces-filled smile and push this young Aces team to reach its potential and make the city proud.